I have been studying marine mammals since 1983, when I was an undergraduate. My main interests are the development of marine mammal identification aids, and the systematics and population ecology of the more poorly-known species of dolphins and porpoises. Essentially all of my work since 1983 has been related to conservation and management of marine mammals threatened by human activities. Since 1995, I have been working in Southeast Asia, and have traveled widely in the region. My current primary research focuses on the conservation biology of Indo-Pacific humpback dolphin (Sousa chinensis) and finless porpoise (Neophocaena phocaenoides) populations in Hong Kong and surrounding waters. I am also working on other projects looking at the systematics and ecology of these species throughout their ranges. 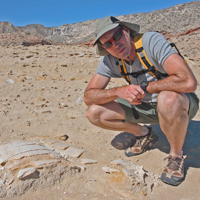 In addition, I am involved in many other projects, including those on the conservation of the critically-endangered vaquita (Phocoena sinus) and on the taxonomy and population ecology of common dolphins (Delphinus spp.). With co-authors, Marc Webber and Robert Pitman, I published a comprehensive identification guide, Marine Mammals of the World (Academic Press, second edition, 2015). My outside interests include mountain biking, hiking, drums and percussion, outdoor photography, and wildlands preservation. I am married and live in San Diego.